No surprise to see The New York Times, Reuters, and The Economist report this, as Ahn Cheol-soo’s formal announcement to run for the Korean presidency is indeed newsworthy. Here are five reasons why the U.S. should pay attention to this election cycle. 1. Ahn epitomizes a drastic paradigm shift in the Korean populous. He cries for the need for “horizontal leadership” in the presidency, one that will listen and heed to the needs of the people, and rule for the people as a whole. He is the prime example of the “T-Rex Squared” leader I wrote about in a post depicting a new leadership paradigm for the twenty-first century (read it here). The Korean people want their voices heard, and many now consider Ahn to be their vehicle of choice. But what is the current “voice” of the Korean people in regards to the U.S.? There are numerous sensitive political issues, the KORUS FTA, military outposts and command chains, and the Investor-State Dispute resolution process being a few. How Ahn conveys Korea’s position on such issues will be critical to Korea-U.S. relations in the coming years. 2. Ahn is a true “outsider”. He has never held political office, and he has never been directly involved in policy making. He is an ex-doctor, an ex-venture CEO, and now an ex-professor and college dean. His latest best-selling book, “Ahn Cheol-soo’s Thoughts”, and his rhetoric thus far is eerily similar to President Obama’s “Change” slogan of 2008. Indeed, Ahn’s central message is an overhaul in many critical arenas – politics, business, taxes, and so on. What’s different about Ahn, compared to Obama, is that Ahn is truly an outsider – he is not (yet) part of a major political party. Although winning a presidential election without the help of a party will be a daunting task, Ahn believes he only needs grassroots support of the people to win and bring genuine change. 3. 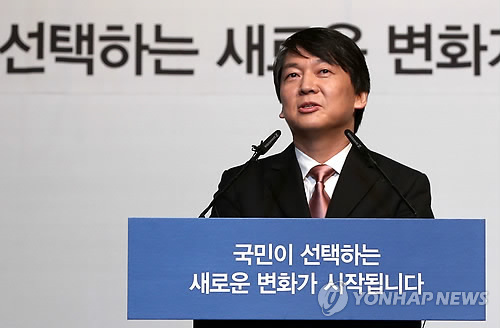 Ahn will call for major changes within Korean big businesses and the “chaebol”s. The term “economic democratization” has been thrown around repeatedly thus far, its main purpose being tighter restrictions on business and demanding transparency in business processes. Similar to Obama’s rhetoric, and the Democratic Party platform, Ahn seems to reject the “trickle down” economic theory; instead, he emphasizes accountability in business and the government’s role in providing fair opportunities for the jobless. If Ahn is elected, the impact on business should be watched closely, as Korea an its companies are a major trading partner of the U.S.
4. Ahn is already calling for a revolutionized election process, and furthermore, Ahn strives to be a symbol of a transformed political process as a whole – transparent, fair, and more democratized with the incorporation of voters’ views. I find it interesting that the U.S. has not yet used its leverage to press Korea to clean up its political scene, given its notorious scandals over the years. Straying away for old-school politics, where generations voted based on where the candidate was from or from what political faction he was in, Ahn is presenting a new political paradigm. 5. Ahn’s stance on North Korea should not be equated to that of the current opposition party. Although he has not yet made it crystal clear, Ahn’s approach to the North does not seem to be as lenient. While his stance would probably be more warm-hearted than that of the current Lee administration, and based on two-way dialogue between the nations, one would expect Ahn to hold the North accountable on many more issues before blindly pouring aid into the country. If elected, Ahn’s interaction with the U.S. State Department regarding the North would be interesting to observe. Korea is standing before major crossroads. The chosen path will indeed affect how Korea and U.S. will dine together for years to come.